Landslides are the most common geomorphic hazard processes in Sub-Carpathians regions. Crossing the Getic Sub-Carpathians between Campulung Muscel city (the first royal residence of Romanian Country) and Ramnicu Valcea city, the 73C National Road is constructed for more than 90% on sloping surfaces. A wide variety of landslide types, a high landslide frequency (over 5 landslides reactivations/year and other new triggering) and a high density (between 0.5 and 3.3 landslides/km) are the main characteristics of the slope instability along the 73C National Road. Many stabilisation and repair works have been completed, but different section remain vulnerable to landslide damage. 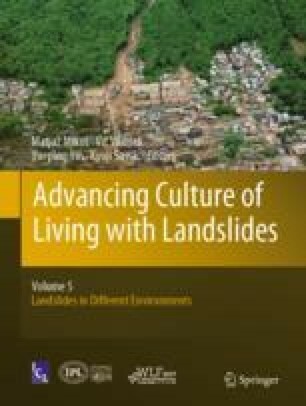 The study aims are to map the different types of landslides, to identify the landslides causes and their impact of landslides related to 73C National Road and its communities, to identify new morphological surfaces which may have a high landslide susceptibility at and to assess the impact of landslides. The main causes of landslides along 73C National Road are hydrogeologically controlled and are linked to high degree of drainage density and deforestation. A multy-disciplinary approach was taken, consisting: landslides mapping, historical maps analysis, geomorphological and geophysical methods, topographic and geotechnical surveys. The results highlight considerable vulnerability of slope stabilisation works as a consequence of an incomplete understanding of landslide processes and limited stabilisation works involving just the road embankment. We want to thank GEO-SERV llc for the geotechnical data and also our thanks for all persons that choose to remain anonymous and were consulted in the time of study.